Mark Cushman is well-versed in the power of persistence. In 1977, Cushman, Distinguished Professor of Medicinal Chemistry, created an organic compound in his Purdue lab. It was an undesired byproduct formed during the synthesis of a natural product with anti-leukemic activity. Thirty-six years later, more than 500 structural analogues of that byproduct have been synthesized, and two of them are now in clinical trials at the National Cancer Institute. They have the potential to become mass-produced, life-saving treatments for cancer patients. 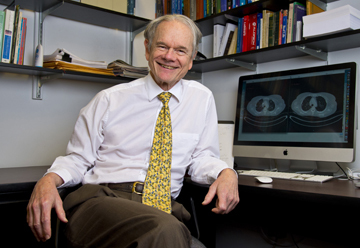 For his outstanding contributions to medicinal chemistry and drug discovery, last year Cushman was named a fellow of the American Association for the Advancement of Science, the world's largest general scientific society. What's the origin of the drugs that are now in clinical trials? It's quite a long story. Essentially, in 1977, two years after I joined Purdue's faculty, a representative from the National Cancer Institute heard about the anti-leukemic agent that we had synthesized in our lab. He called me up and told me that the institute already had enough of that particular anti-leukemic agent. He asked me to send them something they did not already have. That's when I decided to send him the byproduct, which was determined to inhibit an enzyme that is an anti-cancer drug target. The biological activity of that byproduct had to be optimized. We ended up making hundreds of new structural analogues of it. In 2006, we reported compounds known as LMP400, or indotecan, and LMP776, or indimitecan. It turns out that these compounds have the potential to treat cancer. They're in clinical trials now, and the preliminary results are very encouraging. Was it exciting when you learned that these compounds might turn into life-saving cancer treatments? It was very exciting. The odds of a drug being manufactured from a medicinal chemist's discovery are very, very slim. A medicinal chemist might create 10,000 compounds before he or she discovers one that leads to a manufactured drug, so I was elated when our discovery yielded indotecan and indimitecan. What are the details of the clinical trials? These drugs have been in the first phase of clinical trials since January 2010. One of them shrunk the colon cancer nodules in the lungs of a patient who had been resistant to all of the usual treatments -- and the shrinkage happened after the first five days of administering the drug. Those are some very exciting results. Right now, the drugs don't target a specific kind of cancer. We're still investigating ways to refine the drugs -- we're actually working to see if we can get them to target prostate cancer cells. I'm collaborating with Phil Low, the Ralph C. Corley Distinguished Professor of Chemistry, on that project. What are the next steps for these drugs? As a general rule of thumb, it takes 13-16 years for a drug to go from discovery to manufacturing and marketing. Six to eight years after clinical trials begin, paperwork is usually filed with the FDA seeking the drug's approval. Then, it usually takes two years or more for the application to be approved, if it's approved at all. So, we're still in the very early stages of figuring out whether the drugs we discovered will be approved and marketed to the public. Frankly, it's never a sure thing whether a drug will be approved and marketed, but I'll say it appears that these drugs stand a better chance than I ever imagined. What are some of your other professional responsibilities? I teach medicinal chemistry to undergraduates, graduate students and professional students. I serve on faculty recruiting committees, faculty promotions committees, and graduate student recruiting and admission committees here at the University, and I'm also an associate editor for the Journal of Medicinal Chemistry, which is the primary journal in my field. What's the most rewarding aspect of your work? It's definitely seeing the positive results of my research -- like the patient I described who's being helped in the clinical trial. Doing this work can be like spending time in Las Vegas. We roll the dice and take our chances every time we create a new compound. The failure rate is high, and usually things don't work out as we expect. However, when we create something that turns out to be really promising, it's a huge rush. It's like hitting a jackpot. That's ultimately why I got into this field -- to help people -- and I think that's just very gratifying.